March was a month packed full of events across the region, with inspirational speakers and information, and raising of awareness of key health issues and actions. The Eastern Elder Abuse Network (EEAN), led by Eastern Community Legal Centre, hosted an event with keynote speaker Gerard Mansour, Commissioner for Senior Victorians and Ambassador for Elder Abuse Prevention, presenting on Elder Abuse Prevention. The IEPCP is a keen supporter of EEAN, and we met up with Kate Gibson and Jill Exon (ECLC) following the event to discuss IEPCP support for their new primary prevention of elder abuse project. Funded by the Department of Health & Human Services through the Free From Violence Fund, the OPERA Project is a partnership between ECLC, Swinburne University and Women’s Health East, with the aim of gaining a deeper understanding of how older people in Melbourne’s east experience ageism and age discrimination. Catriona Ross, Senior Advisor Population Health and Community Wellbeing, Department of Health and Human Services. Catriona works to embed the priorities of the Victorian Public Health and Wellbeing Plan in local initiatives and place-based approaches. In particular, she works with local government and funded agencies on the uptake and delivery of prevention initiatives. Current priorities include alcohol-harm reduction, social connection for older people in public housing, and helping her Division to build knowledge and respect for Aboriginal histories and cultures. Sulo Colombage, Gender Equality Officer, Carrington Health. Sulo’s role involves working in the prevention of violence against women in partnership with TFER. At the moment her focus is engaging staff and management around a commitment to gender equality and formulating a gender equity action plan for the organization. Her work also involves working with the successful Baby Makes 3 program – an initiative for first-time parents focused on primary prevention of family violence. Bonnie Coogan, Health Promotion Practitioner, Access Health and Community, the local community health service for Boroondara and Manningham. Bonnie is currently involved in a range of projects that focus on improving social inclusion and gender equity – working with sporting clubs, early childhood centres, schools and LGBTI+ young people in the wider community. She is also an active member of the TFER Evaluation Working Group. Danielle Utting, Director of Care3, a company established to provide case management and aged care placement services for older people and their families. Danielle works with older people to help support them to remain independent in their own homes, or to find facility-based care. Danielle is keen to give a voice to older people and help improve the value they have in our society. Alex Mills coordinates The Opening Doors Community Leadership Program at Link Health and Community, an evidence-based social inclusion program. He is also a White Ribbon ambassador and a passionate advocate for gender equity. Lara Gerrand, Health Promotion Officer, Women’s Health East, focuses on sexual and reproductive health in her work. Lara has a Bachelor of Public Health & Health Promotion & a Diploma in Youth Work. Her previous work includes extensive experience working with youth in delivering reproductive health services and education. In addition, the IEPCP congratulates Women’s Health East on a wonderful celebration of women held at Sage’s hotel. 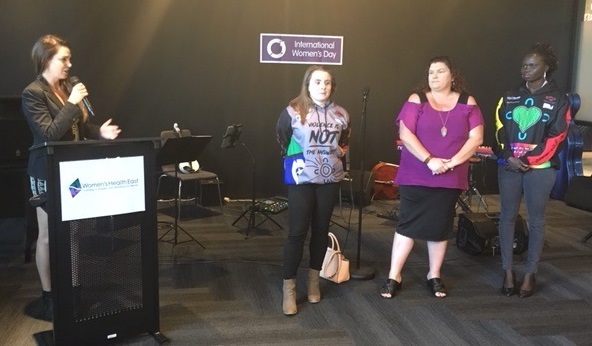 I was blown away by the presentation from the young women working on the Liwurruk (Girls) in the Hood Project (Hoodies Project), led by Boorndawan Willam Aboriginal Healing Service, with support from WHE, HICSA and Eastern Health. The purpose of the project was to promote gender equality and the prevention of violence against Aboriginal women. Over eight weeks, these young Aboriginal women participated in capacity building sessions to develop their understanding of healthy, respectful, equal and respectful relationships with themselves and with others, in the context of cultural complexities. The project was designed to provide them with an outlet to challenge racism, gender stereotypes and violence that limits young Aboriginal women’s potential, and to celebrate young Aboriginal women’s empowering ideas, words pictures and stories. Who are you? What do you stand for? What inspires you? What does equality mean to you? What are the messages you want your community, and beyond, to hear about preventing violence? The answers to these questions were visually represented on the hoodies the young women designed and are pictured here with WHE Manager of Health Promotion, Autumn Pierce. Another celebration, opened by the Hon. Richard Wynne MP, Minister for Planning, was the recognition of Access Health and Community’s 150 years of service as a community health service – the oldest health service in Victoria. It was an entertaining walk through history and service amalgamations, with staff sharing their journeys and CEO Harry Majewski presenting on the complex service and challenges today. It was another terrific networking opportunity and was followed by an opportunity to meet with Jane Broadhead, General Manager Community, and David Cooke, Senior Manager at Access H&C to share information and hear about their aspirations for their team in supporting vulnerable community members in place across Boroondara and Manningham. I also enjoyed catching up with Gregg Nicholls, interim CEO at Link Health and Community, and former Board member of the IEPCP, to share notes and opportunities to collaborate across the Monash area. The IEPCP also wishes to acknowledge the amazing efforts of Manningham’s Social Planner Vicki Martinez who has led health planning and the current Healthy City Strategy & Action Plan and provided support to the Council’s Advisory Group, of which IEPCP is a member. It was with sadness that we heard about Vicki’s resignation from the role she brought so much experience, quality and sophistication to, however, we wish her every success in her new endeavours as a consultant. 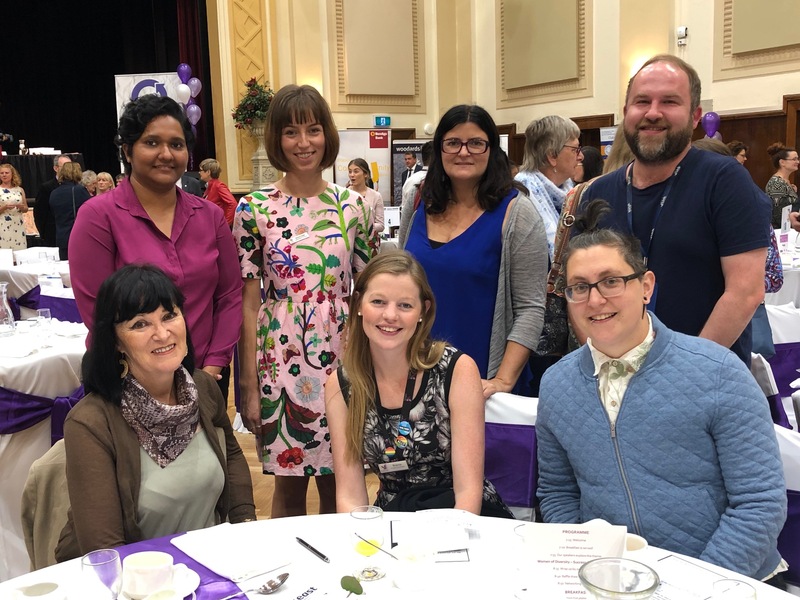 Last month I also had the opportunity to attend a regional forum hosted by Eastern Volunteers and Victoria Alive exploring the barriers to, and opportunities for, volunteering for people with disabilities in the Eastern and South East Metro areas. Over 50 organisations attended and there was a strong commitment to supporting increasing volunteer opportunities. We heard from a passionate panel of volunteers about their experiences, and participants contributed a range of ideas during a workshop. An action plan will now be developed. This will be overseen by a governance group of Volunteer Resource Centres and Support Services facilitated by the Inner East PCP, and work will be led by Eastern Volunteers in the east, and South East Volunteers and Bridges Connecting Communities in the south-east. And in some exciting IEPCP news, we recently welcomed Steph Ashby, Prevention Coordinator to the IEPCP team. She hit the ground running in her first week at our IEPCP planning day, held off-site at Currawong Bush Park in Doncaster, where the team was involved in a dynamic session to plan and schedule activities for the coming months.